Awarded a huge ‘thumbs up’ from respected beauty editor and Sunday Times columnist India Knight, Aurelia Probiotic Skincare’s BioOrganic Botanical Cream Deodorant harnesses natural, antibacterial ingredients to keep your underarms dry, fresh and sweetly-scented without any aluminium – ideal for those who like to err on the side of caution when selecting their skin care essentials. 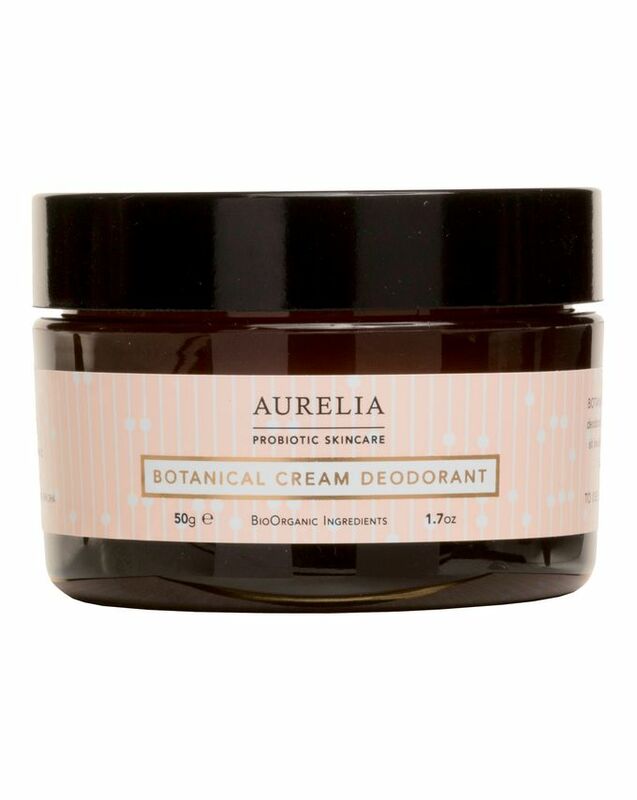 With a cream-to-powder consistency that permits easy, fingertip application, Aurelia’s innovative BioOrganic Botanical Cream Deodorant comprises superfine, powdered plant-derived botanicals – including antimicrobial arrowroot and pure, moisture-absorbing kaolin clay – which sit invisibly upon the skin to absorb perspiration all day long; maintaining dryness and inhibiting odour-causing bacteria for optimal (and sustained) freshness. Shea butter then hydrates and nourishes the delicate, underarm area, while oils of tea tree, eucalyptus and peppermint are blended with distilled lavender extract to impart a clean and subtle fragrance. Apply a fingertip-size amount on to clean skin and gently rub it into your whole underarm area. This magical cream-to-powder formulation contains no unnecessary hardeners or waxes so the consistency can sometimes change in hot climates. If the cream ever separates simply mix it gently and place in the fridge until it cools and hardens. Don’t worry if this does happen it will not impact its effectiveness! The absolute best deodorant ever made :) I just can't use anything else once I tried it. Non-sticky, all natural, amazing smell and it WORKS! Love love love ❤️ This deodorant smells amazing and it’s working very well for me easy to use an amazing texture for sure I’m going to buy it again. Goes on well and smells divine. Unfortunately, I needed to reapply after half a day as it does not act well as a deodorant. I'll use this jar up but I won't purchase again. Money wasted - sorry. I am living in the tropics and deodorant seems like a must daily! I have tried some organic deodorant lately due to health and safety concerns but those usually ended up wetting my underarm instead... so embarrassing! But not anymore until I've read all the good comments about it and decided to give it a try. This is a miracle worker for me. I suffered from over-reactive, itchy armpits and nothing was helping while keeping me from smelling. Since I use this product all my problems disappeared. As a bonus, this is the best keeping smell away product I've ever used. I wish this would come in a stick, cause I don't enjoy the smell and texture on my fingers, but it's nothing that would draw me back from repurchasing. After a very nasty allergic reaction to a deodorant years ago, my under arms have been super sensitive and easily irritated. Itchy armpits are hideous! This doesn't irritate at all, smells gorgeous and really works! So delighted, I'll keep using it from now on. Can't believe that with the strong (but gorgeous) smell I have absolutely no irritation. Can we have a supersize jar please? Do not stop selling this. I am on my sixth bottle now, love this product so much. It's effective and unlike so many other natural deodorants it didn't irritate or burn my armpits, plus it smells lovely. I wanted to find a natural deodorant to use on my very sensitive underarms, and this one works wonders. The smell is quite strong and doesn't go away, but it keeps you fresh all day. Would recommend and repurchase. Read all the reviews prior to buying so admittedly I was sceptical. But it matched my brief. Organic, natural, easy to apply, free from all the "usual suspects" and above all. Keep me smelling fresh. I loved this unusual cream to powder deodorant. Of course the price is quite steep but I think it's very good value for money. Thank you. This is a great product: easy to apply, nourishes my dry and sensitive skin and works very well. I didn't know what to expect of the scent (based on the reviews), but I actually find it quite subtle. The eucalyptus smell is not overpowering and quickly fades. I will definitely repurchase. This actually works and I was very surprised. Great if you want to avoid chemicals and have sensitive skin like me. I will keep buying this even though it is a little bit odd and expensive (but it works!). I've been trying loads of aluminium free product over the years, but not managed to find anything that actually work in summer or if I'm running about. This product is totally amazing! And it works so well. I'm actually quite shocked how well. I'll be buying it for life now. Love the minty fresh smell. I wanted this to work because its not often you find a natural deo. But tried it on and off to make sure this is not the one causing itchiness in my underarms, but sadly it is. I bought this after reading the reviews as I have been looking for a deodorant without aluminium. I live in South Asia with high humidity. I have been using this product for almost a month and can say it works well for me. I did not experience any itching or irritation. Love the smell. It keeps you smelling great BUT it irritates my skin which doesn't happen with any other deodorant, it leaves my underarms very dry with bumps. I love it and never use anything else. I have a situation in my underarms where I can't use any deodorant. Because I have extra sensitive skin. I used to use Louise Widmer cream deodorant but it stopped working for me. So I did some research and landed the Aurelia Deodorant. It smells very nice, quite a strong minty scent, I could've done with a weaker scent but still, it doesn't bother me. I always smell nice and feel fresh, I totally recommend this! I have tried every antiperspirant/deodorant without aluminium and this is the first one that keeps me from smelling. It does not completely stop wetness, but it gets the job done. One of the best deodorants I've ever tried. Natural, nasty-free, calming and really works. I just don't give 5 starts because the application is not practical (not a problem when home, but still) and the price tag is way too high for a deodorant (there are other natural options available that are just as efficient and cost half of this), but I still really like it. I have tried every antiperspirant/deodorant without aluminium and this is the first one that keeps me from smelling. It does not completely stop wetness, but is excellent as far as keeping me smelling fresh all day. After you apply it with your fingers rinse them in hot water with soap and your fingers will be deodorant free. I was sooo excited to try this, but I am disappointed. I mean, it is not bad, but I don't like the strong eucalyptus-like smell and the cooling effect in has either. I expected a much more subtle, herbal smell. Also, after I apply it with my fingers, the smell stays on my fingers for a while, it doesn't wash off with soap and water right-away. If you like eucalyptus smell for a deodorant and don't mind the cooling effect/tingling, go for it. I have tried several organic brands for their deodorants, but Aurelia's beat them all. Not only is the scent uplifting (personally I like this scent better than their cleanser's but I do love both), the balm to powder texture makes your skin feel fresh all day long - the minty tingling on skin is a bonus!